At Sherwood Family Dentistry, we offer a variety of services to meet the dental needs of you and your family members. From general procedures to cosmetic dentistry, you don’t have to look any further than our talented and caring dentists and accommodating office staff. At every visit, you will receive our five-star personalized customer service and any concerns or fears you may have are addressed up front. Both Dr. Chao and Dr. Craw explain everything thoroughly and take a conservative and thoughtful approach to every dental recommendation they make. Check out our services below and for more details of a particular service, click on the bold words. Please feel free to contact us at (714) 572-2363 or email at info@sherwoodfamilydentistry.com to schedule your appointment and/or ask any further questions. It’s that easy! We believe that dentistry is not expensive but neglect is. That is why we make it as pleasant as possible for you and your family to come in and get your preventative services and teeth cleanings done on a regular basis for good oral health. In addition to making you feel comfortable, we get you in and out of the office quickly, work with your insurance so you pay as little as possible and only recommend additional dental work as needed. Our clients' trust is very important to us and we do everything to earnit and protect it. 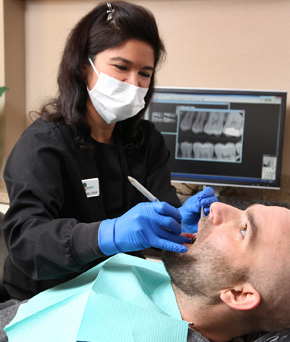 In addition to regular cleanings, we offer sealants, night guard therapy and fluoride treatments. In addition to preventive procedures, we offer restorative and specialty services to fix any dental issues that prevent you from having your very best smile. These services include crowns, composite fillings, orthodontics, bridges, dentures, periodontal treatments, root canals and implants. To take your smile to the next level, we offer cosmetic procedures including teeth whitening for extra brightness and porcelain veneers for a natural look to broken or problem teeth. If you have any questions regarding our services offered or are ready to get started on obtaining your perfect smile, give us a call or send us an email. We would love to add you to our growing list of satisfied and loyal customers! You will quickly see why our customers consistently give us a five star ratings on review websites such as Yelp. A composite (white/tooth colored) filling is used to repair a tooth that is affected by decay, cracks, fractures, and more. The decayed or affected portion of the tooth will be removed and then filled with a composite filling. Orthodontics is a branch of dentistry specializing in the diagnosis, prevention, and treatment of jaw, face and bite irregularities. Recent years have brought about many changes within the dental industry, specifically with regards to orthodontic treatment and care. Now more than ever patients are experiencing fewer incidences of cavities and missing teeth due to the heightened awareness of fluoride use and preventative dentistry. This increasing awareness on the health and look of a patient’s smile has fueled the desire for many to seek out orthodontia not only as a medical necessity, but for cosmetic reasons as well. The word periodontal means “around the tooth”. Periodontal disease attacks the gums and the bone that support the teeth. Plaque is a sticky film of food debris, bacteria, and saliva. If plaque is not removed, it turns into calculus (tartar). When plaque and calculus are not removed, they begin to destroy the gums and bone. Periodontal disease is characterized by red, swollen, and bleeding gums. Most people are not aware of it because the disease is usually painless in the early stages. Examination of digital diagnostic x-rays: Essential for detection of decay, tumors, cysts, and bone loss. Root canal therapy is needed when the nerve of a tooth is affected by decay or infection. In order to save the tooth, the pulp (the living tissue inside the tooth), nerves, bacteria, and any decay are removed and the resulting space is filled with special, medicated, dental materials, which restore the tooth to its full function. Having a root canal done on a tooth is the treatment of choice to save a tooth that otherwise would die and have to be removed. Many patients believe that removing a tooth that has problems is the solution, but what is not realized is that extracting a tooth will ultimately be more costly and cause significant problems for adjacent teeth. Root canal treatment is highly successful and usually lasts a lifetime, although on occasion, a tooth will have to be retreated due to new infections. Fill out the form below and we will contact you during our working hours. If you have a dental emergency, please call 714-572-2363.